Eating healthy food isn't all about looking good. For a lot of us, it's about feeling good too. This collection of recipes features low carb recipes that are perfect for those trying to follow a low carb diet. But, now you won't have to give up your favorite, feel-good recipes. Check out Our Favorite Feel Good Foods: 11 Low Carb Recipes, and let us know which recipe is your favorite. 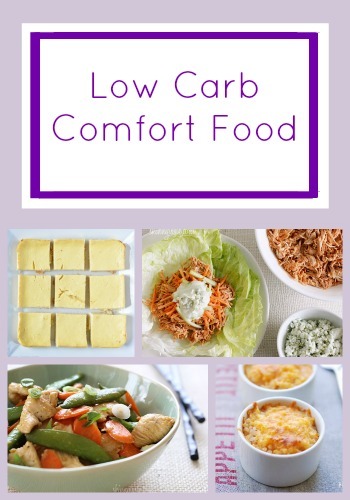 Here at FaveHealthyRecipes, we can't seem to decide which low carb recipe is the best. At our office, there's currently a war going on over these feel good foods, and you can help us pick the winning recipe. Head down to the comments, and let us know what you think! It's almost impossible to find all of our amazing low carb recipes. In order to help you with your search, here are 24 of our Best Ever Low Carb Recipes! These meringue cookies will satisfy your sweet tooth, and you won't feel guilty a few hours later. You'll love that these cookies have only 8.2 grams of carbohydrates. Chicken nuggets are a kid's favorite comfort food. But, don't worry, these adult-friendly chicken nuggets have only 7.7 grams of carbohydrates. Simply sweet and absolutely amazing, you're going to love these Low Carb Lemon Squares. There are so many good things about this slaw. We don't even know where to begin. For starters, a serving of this side dish has only 10.1 grams of carbohydrates. It can't get much better than this summer salad recipe. With only 11.7 grams of carbohydrates, this crab salad recipe will be sure to put a smile on your face. It's hard to believe that this is such a healthy mac and cheese recipe. Would you ever guess that a serving of this dish has only .8 grams of carbohydrates? Want even more low carb recipes? Check out our Low Carb Recipes eCookbook. It's free to download and easy to print! This tater tot casserole both looks and tastes AMAZING. Plus, it's a low carb and high protein recipe. This dish will be perfect anytime and anywhere. Wowza. Can you believe that a serving of this stir fry has only 10 grams of carbohydrates? Oh boy, oh boy. This is my absolute favorite recipe. With only 5.2 grams of carbohydrates per serving, I know that you'll love it, too! In the mood for stir fry? Well, this recipe is sure to please. It only has 7 grams of carbohydrates per serving. This healthy fish recipe will be the perfect fish Friday recipe. With only 1.7 grams of carbohydrates, you can be sure that it won't weigh you down. The Mango Slaw looks fantastic!